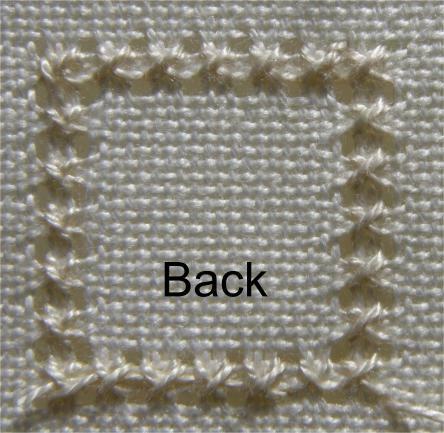 Four sided stitch is reversible and found in many types of needlework especially pulled work and hardanger embroidery. You can use normal tension or pull each stitch to create a lacy effect with a hole in each corner. 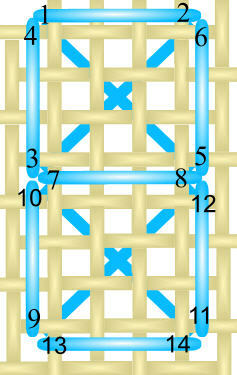 This stitch produces squares on the front of the fabric (as shown in the photograph, below) and crosses on the back (see photo at bottom of page). 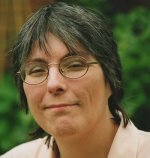 The stitch can be worked horizontally, vertically or diagonally, in single rows or grouped together to fill an area of a design. It can be worked over two or four fabric threads, we will use four in the diagrams and instructions below. The stitch is usually worked with the finer of the two perle threads when doing Hardanger embroidery, leaving the thicker thread for the kloster blocks and satin stitch motifs. 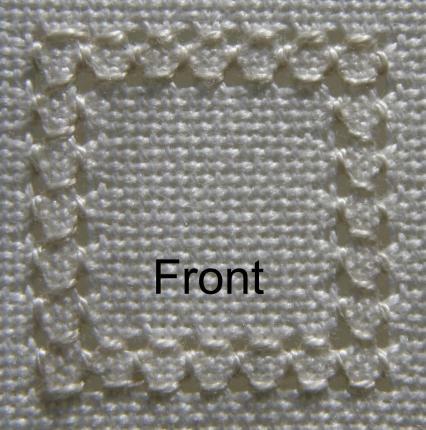 This embroidery stitch is used in our free hardanger coaster project, part of my free learn hardanger course. 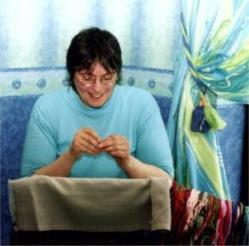 You can also see it in use in the downloadable hardanger design Wish Upon a Star. Both sides of the work can look neat, a fact brought home to me while exhibiting at the Stitches exhibition in Birmingham one year. I had a framed piece of hardanger on the wall of my stall for all three days of the show. It had been a mad dash as I had only managed to pick it up from the framers the day before the show. It wasn't until the third day, when I went over to it to show a visitor what four-sided stitch looked like, that I realized that the framer had framed it the back to front! 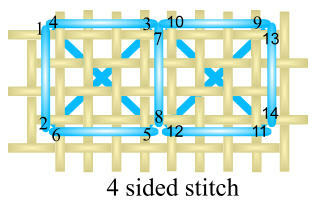 Using perle 8, if working on 22 count hardanger fabric, or 12 on finer fabrics such as 28 count evenweave or 32 count linen, follow the diagram below. Start by bringing the needle to the front at point 1. Take the needle down over 4 fabric threads and then back up 4 threads to the right of 1 at point 3. Take a horizontal stitch and go down at 4 (reusing hole 1). Back up at 5 and down at 6. When you place the last stitch of the first "square" you will be creating the first stitch of the second square at the same time. Continue in this manner, pulling if desired, remembering to check the pattern for any change of direction. It is easy to get carried away with working this stitch and then find you have gone too far! Vertical rows are worked in the same manner following the numbering in the diagram below. As mentioned at the top of the page, four sided stitch produces crosses on the back of the work, as can be seen in the photograph, below.